A lot of criticism has been directed at the ABC and Fairfax Media and others for bias in regards to their reporting. Whether that is true or not could and should be debated but the worst of all, Channel 7 has been badly missed. Channel 7’s corrupt conduct involves hundreds of millions of dollars being stolen from the tax payer to boost the profitability and value of Channel 7. So when you wonder why there is so much corruption and fraud and theft in government and why the media like Channel 7 fail to report a lot of it, why we have to now work to 70, why we have to pay for doctors and why pensioners have to tighten their belt etc.? One reason is to keep the likes of Channel 7 filthy rich. In February 2010 the then Prime Minister Kevin Rudd and the Minister for Communications Stephen Conroy announced a temporary reduction in “licence fees networks pay by 33 per cent this year and 50 per cent in 2011″. 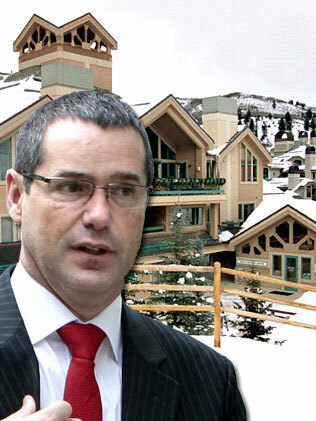 I think that is Kerry Stokes Beaver Creek house behind Stephen Conroy. I wonder if the reduction in TV fees help pay it off. Eventually the reduction was made permanent and in 2013 the license fees were decreased by another 50%. So the real reduction (money taken from tax payers) is probably valued at around $400 to $500 million. I know some educated guesses have it at $600 to $700 million. A prime example of Channel 7 taking a bribe for better coverage for the Labor Party is the AWU fraud which Channel 7 has been extremely quiet on overall. In fact Channel 7 used its current affair program to attack Ralph Blewitt who is one of the key witnesses against Julia Gillard. That would be ok if they had also reported in a balanced way the evidence against Julia Gillard but they did no do that. It was almost like they were on the Labor Party payroll which given the reduction in TV fees they were on Labor’s payroll. Or as Abbott said they had taken “an election year bribe”. Channel 7 in effect tried to help the Labor Party cover-up the AWU fraud. Channel 10 is almost bankrupt and Channel 9 are newly listed on the stock market and I do not know if they make a profit. But I believe Channel 7 do make a profit and could and should pay their share of taxes. Here we are whingeing about foreign companies not paying their fare share of taxes yet the government turns a blind eye to Australian companies such as Channel 7 not paying their fare share. The television fees are a tax and should be increased to where they were previously and then some to make up for the billions of dollars that tax payers have lost since 2010. I personally do not want to work to 70 just so I can help filthy rich people stay filthy rich. This is an issue that needs driving and I will be doing that. Admin: The contempt proceedings instituted by Kerry Stokes and his girlfriend lawyer Justine Munsie against me has been set down for hearing on the 15th of July 2014. What for? I told people Mr Stokes was suing me for defamation when Mr Stokes had a suppression order so I could not tell people. Mr Stokes obviously believes journalism is a crime. If you would like to help please read below and donate. Channel 7 sure has been quiet and very selective in its reporting of the AWU scandal. I mostly watch their news and find a small snippet of reporting about the proceedings sometimes buried close to the sports report, rather than where it should rightfully be. The media in general has a lot to answer for in this country with its subservient attitude to its wealthy masters and the “games” they play. Shane, good luck with your continuing case against Stokes, for all the right reasons! This all is truly such a disgrace ,but time is running out for them people all over the world are exposing their Governments and Media for what they are and that is Criminals and Fraudsters ,many Towns in Australia including mine have Public meetings coming up ,we have good on our side and the real truth is coming out fast thanks to many including this site. Of course it is obvious, that if one gives such sums of money to a company such as a television station, that one receives coverage to their advantage, we were sure taken to the cleaners by that lot! The deal must still be in place as there has hardly been any coverage on the Royal Commission anywhere..
Channel 7’s behavior in accepting the previous labor government television bribe is absolutely disgusting. 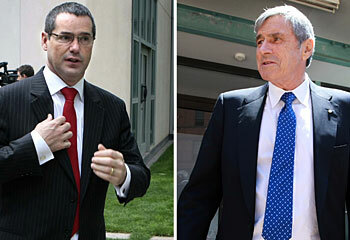 It really shows what a corrupted person Kerry Stokes is. I have noticed that Channel 7 has not reported on the AWU fraud at all over the last 2 years, and that have tried to discredit the story by getting their chief political reporter Mark Riley (A suspected labor supporter) to interview Ralph Blewitt’s sister to condemn Ralph Blewitt. That is one of many examples that the 7 network have done to give favorable corrupted labor party coverage, ignoring the many labor party disasters that were made in their 6 years of government. This is theft against the Australian taxpayer and Kerry Stokes is a criminal who must go to jail. Good luck Shane, take Kerry Stokes to the cleaners Shane. Goodness, what a mess – is there any commercial TV channel in Australia that is not corrupt? Stokes is sueing you for telling us that stokes was sueing you. Talk about “clutching at straws” Stokes needs to be told ‘things have changed a bit in this world’. Go hard Shane as you do anyway, and bring this corrupt fool down! The corruption of many parts of Australian media coverage (through ommision) during the Rudd/Gillard era has to rival the propaganda that Russia effuses against Ukraine. Mainstream voters need to be reminded how they have been manipulated last 6 years…but not me! Obviously corruption occurs wherever money and influence is involved. However, it must be accepted that Australia is little different from other like countries who accept corruption as a way of doing businesses e.g. Indonesia. In politics it’s called “pragmatism”. It’s all really sickening. My problem is that our fragile system called of democracy is now wide open to left wing (communist) manipulation by the Labor Party and the Fairfax/ABC influence. I think Shane and others here may have judged Kerry Stokes a little too harsh… after all, it is his news networks which regularly bring us the information on the latest hi tech, cutting edge wonder-bra technology. This is vital information, essential to our high standard of living and upholding our democracy and civil rights. He is absolutely right in relegating a former prime minister’s involvement in the AWU fraud, massive and questionable cuts to license fees and other trivial matters to insignificant stories which do not even rate a mention. But now on a serious note, KCOA is the kind of journalism that is lacking in Australia (and, in fact, the world). Very few journalists can really be called journalists considering the lame stuff they are forced by their bosses to repeat. When the bigger players/criminals (big business, media, politicians, judges) want to silence a REAL journalist then you know that journalist is onto the truth, something that they desperately want to hide from you. Dear Concerned Aussie, corruption by media reps, owners and journos, cannot be treated so lightly. It has cost our country a generation of prosperity whilst keeping two dreadful Labour Prime Ministers in the public trough for the rest of their lives…. Nothing New our mass media is all corrupt and has been shaping the thinking of Australians for decades. Most Australians won’t believe anything if it is not featured on the main media. How true RonaldR. If anyone has five minutes, or less to spare, check the Canberra Times content on any day of the week. Particularly the letters pages. Canberra is a Labor town full of people who think only Labor can look after the interest of public servants. This really is absolute rubbish, as no political party can claim support of the public service, without lying, because it is not in their collective national interest to do so. Never the less, Canberra has a left wing Labor government, kept in office by one Green member, and supported by the local press (Fairfax Canberra Times).